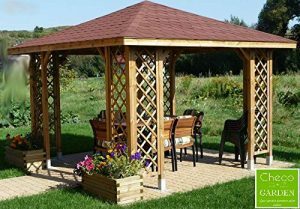 A gazebo is a freestanding structure with a roof and 4 or more legs, garden gazebos can vary a lot in terms of size, shape, structure and design. 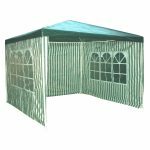 Pop up garden gazebos can also be referred to as pop up marquees can be used for various purposes, but most people tend to use it for relaxation, shade, shelter from weather conditions, for parties and gatherings and even to put over a hot tub. The Airwave Pop Up Gazebos tends to be a popular choice when up comes to choosing an outdoor gazebo. In our table above, we’re particularly focusing on pop up garden gazebos which are designed to erect within a minute or so therefore the material tends to be weaker and more lightweight as it’s not a permanent structure like a brick or wooden gazebo would be. However, pop up gazebos will still have the same use as what a permanent one would be used for. 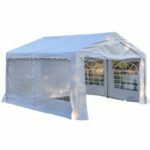 If our comparison table hasn’t provided you with enough information, then check out our best pop up gazebo reviews below. Another alternative could be to opt for a patio awning, however, this is fixed to the wall so won’t offer the same flexibility. It will look more in place alongside with your other garden furniture though. Wind bars – A wind bar is a rod that clips onto the inside of the frame, this provides more support and stability for the gazebo. The purpose of the wind bar is so the gazebo can withstand stronger winds. Side panels – A pop up gazebo with side panels can either be attached or removed from the gazebo, the side panels provide cover or privacy. Windows on side panels – If you decide to use the side panels then some designs may include windows on some of the side panels. Doorway – You will be able to access a gazebo even if it doesn’t have a “doorway”, but for gazebos without a doorway, one side panel will usually be removed to allow access in the gazebo. For gazebos with doorways, at least one of the side panels will have a zip down the middle which you can unzip and then tie both sides to the frame making it look more like a doorway. Waterproof – All of the pop up marquees in the table are waterproof, it can usually withstand medium showers but it probably wouldn’t be the best shelter for heavy rain. One way you can provide heat to your pop up marquee is to place a gas patio heater inside. Electric patio heaters can cause fire hazards so we don’t recommend using one unless the manufacturer specifically says it’s safe to do so. You still have to be cautious when placing a gas patio heater or gas tabletop heater inside. We recommend that you check the user manual or with the manufacturers of both the marquee and patio heater first to ensure it’s safe to put a heater inside. A couple of safety guidelines to follow is to make sure the garden gazebo is well ventilated and don’t place the heater near the gazebo walls. Usually a lot cheaper to buy. Easy to take it down and store it away. Takes up very little space and can easily fit inside your garden storage. Can be placed anywhere in the garden. Structure is quite weak so unlikely to withstand windy weather conditions. Frame is likely to bend in strong weather conditions, making the structure weaker overall. Depending on what material you choose but common structure types such as brick and wood are much stronger. Able to withstand strong weather conditions. This will generally cost a lot more money. If you’re not skilled enough to assemble the gazebo yourself, you have to take into account the cost to hire someone. The gazebo has to stay in one fixed place, unable to freely move it about. Easily assemble this 3 x 3m gazebo within 60 seconds. The steel frame and the two wind bars will all help keep the gazebo standing steady. Waterproof, thanks to the sealed-seams, soft touch polyester fabric. Your own fort – it has four walls, two with windows and the other two with a zipped doorway, which can also be pulled apart like curtains. Four leg weight bags included for four legs. Equipped with anti-puddling eyelets, so that damage is less likely to occur from the weight of heavy water build up. 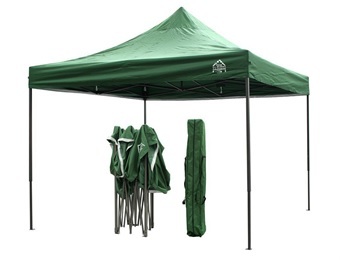 This Airwave pop up gazebo can resist the rain with its waterproof polyester fabric and anti-puddling eyelets, so that’s one less thing to worry about. You can easily construct the frame within 60 seconds, then zip up the doors and peer through the church-style windows on the sides. Its sturdiness is gained from a steel frame, four leg weight bags, and two wind bars for extra stability. 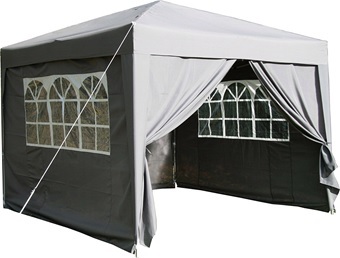 Set up this 3 x 3m gazebo with ease – there’s no need to slot in any poles or fiddle with any bits and bobs lying about! Battle against the rains and showers and win, thanks to the heavy duty canopy and matte black, rust resistant, and powder coated frame. Four leg weight bags will ensure that your gazebo won’t suddenly be swept away by the wind. 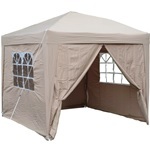 You can set this gazebo up anywhere – it will stand in grass, sand, decking, patios, wherever! Also comes with a premium carry bag with wheels, four pieces of guide rope, and eight tent pegs, as well as a one year warranty! No side panels included, but can be purchased separately. One of the best waterproof gazebos out there – it’s not just showerproof, but also waterproof. Easy to assemble, there’s no need to set up any poles, just open it! Don’t worry about your frame rusting either since its rust resistant. Regardless of where you stand this gazebo, it will survive! And if you believe that it hasn’t exceeded your expectations, you should keep the one year warranty in mind. 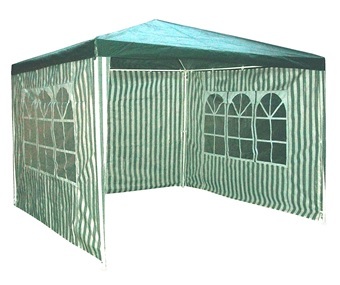 Be prepared to set up this 3 x 3m green and white gazebo. There are four sides to this gazebo – two of which have windows. The durable leg poles are 50% thicker than the normal ones for extra stability. Velcro fasteners are at your service to help and secure closures. Protect yourself under this gazebo from both rain and sun. Stuff the gazebo into the included carry bag, when not in use – yes, it can be folded compactly away! 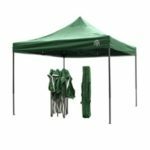 This pop up gazebo with side panels can be folded nicely and stuffed into a bag when not in use, but when in use, you will realise how nicely designed it was! With its extra thick and durable poles for stability and its four sides, two of which have windows. The velcro fasteners will also help with the secure state of this gazebo! And you know what is the best thing about this gazebo is? You can protect yourself under it in both rain and shine. 4 x 4m – the largest pop up gazebo on this list! Steel frame is fully galvanised, rust resistance, and made to be of high quality. Joints are heavy duty and metal, so is durable and extra stable. Polyethylene cover is waterproof and unlikely to rot. Side walls are removable and zipped doors provide a way to keep ventilated. Even has a water seepage hole to deal with the rain. No leg weights included, so isn’t very wind resistant unless you buy separate leg weights for it. A large pop up gazebo that can withstand the rain without the steel frame rusting since it is galvanised. 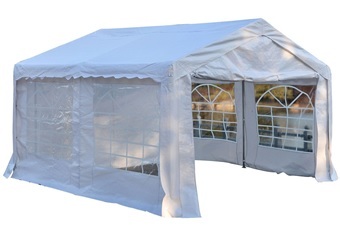 Cover is also waterproof, so you don’t have to worry about rain slipping into the gazebo, while you’re still in it. 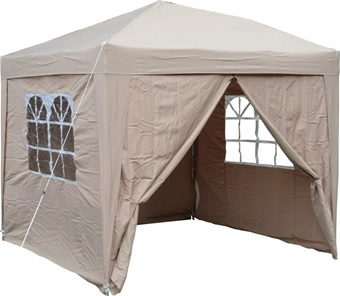 Side walls can be removed, so you can set up the gazebo as you wish, and the zipped doors also prove to be useful. 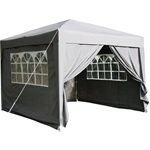 In addition, it can be used as a portable carport as well as for hosting parties and events. This 2.5 x 2.5m gazebo can pop up within 60 seconds. Two attachable wind bars will help provide extra stability, as will the four leg weight bags that can keep the gazebo from flying off. PU coated, soft touch, polyester fabric is waterproof and all seams are tightly sealed. Four walls, two sides with windows, two with zipped doorways. Steel frame is sturdy and durable. Seams may allow water in accidentally. 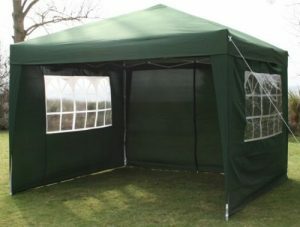 Need a small pop up gazebo? Despite being 2.5 x 2.5m, it can still fit quite a bit in! It is also just as stable as the others – with wind bars and four leg weight bags for extra stability and also a steel frame. The fabric cover is waterproof and fits the steel frame nicely, so you can relax without having rain sneak into the gazebo.